The most horrifying syndicate of evil in history! When people think about horror literature adapted for the silver screen, their minds will likely turn to names such as Poe, Lovecraft, and King, and rightfully so. However, there’s another more unheralded author whose works have been translated into celluloid numerous times: Edgar Wallace. Cinematically speaking, he is perhaps best known as the man behind King Kong (ironically, his work on the film was uncredited), but his staggering output in the mystery/thriller genre has also served as the basis for a number of films. In Germany, it inspired an entire genre and series of films called krimis, which are often seen as a distant cousin to the Italian giallo films. 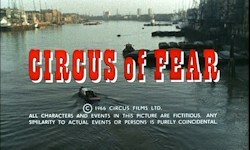 1966’s Circus of Fear was a British production based on Wallace's The Three Just Men, but it did star one fairly famous German in the form of Klaus Kinski. Starring opposite of him was genre stalwart Christopher Lee in this thriller that was picked up (and heavily edited by) American International Pictures for distribution in the United States. The film opens in a most unexpected way--with a cleverly plotted and executed bank heist that results in the death of a security guard. All of the men involved in the robbery split up the loot, and one of them is charged with the task of delivering the unknown, unseen mastermind his share. This leads us to the titular circus, where the crook delivering the money is killed by a throwing knife. A police detective (Genn) follows the clues and finds that this circus is full of underhanded and shady characters, such as a dwarf with a penchant for blackmail, a cunning knife thrower, and a lion tamer (Lee) who must always wear a mask because his face was disfigured in an accident. 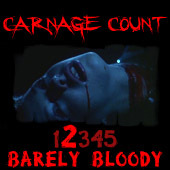 The body count continues to rise as Detective Elliot unravels more clues about the killer’s identity. Circus of Fear is your standard whodunnit mystery film: there’s plenty of red herrings, complicated sub-plots, and, of course, murder. While the film’s premise and some of the marketing makes this one out to be some sort of circus-set proto-slasher, that’s not the case. Christopher Lee’s black-masked appearance certainly looks like something out of a giallo, but the actual murders are few and far between, and none of them are elaborate or gory. Instead, the film is much more focused on unveiling its complicated plot through a series of twists and turns. Many possible (and somehow plausible) scenarios are dreamed up by the detective and other characters in an attempt to uncover the killer’s identity. It’s all very dialogue-heavy and establishes a number of backstories in an attempt to explain everyone’s possible motives, so you’ll have to have a sharp ear to keep up with this one. In typical murder mystery fashion, the plot is probably a bit too elaborate. It’s also rather listless for much of the film, as it takes a while for it to settle in and begin to provide clues and hints. The movie is somewhat burdened by this fact and gets a bit crushed under its own weight. Though Moxey’s direction is visually excellent (the opening heist scene is expertly shot and features some calculated editing), the script itself has trouble being compelling for the entire running time. It would probably help if the script gave Moxey more scenes that were more conductive to interesting visuals. It’s a shame that the circus setting is a bit wasted and feels pretty much incidental--we get some fun, albeit random gags from the performers, but that’s about it. Like a good circus trick, though, the film does manage to misdirect audiences as the plot unwinds. Some twists and reveals are more clever than others, and the climactic reveal of the murderer actually pales in comparison to an earlier surprise, which gives the film a bit of a backwards feeling. While the film is a bit bland as a murder mystery for most of the time, the performances are at least good. Lee is no doubt the highlight--even hidden underneath a mask for much of the film, he still emits a sense of pathos and elegance from his unmistakable voice. In typical Lee fashion, he’s also menacing when he has to be; likewise, Kinski skulks around in the shadows a lot and looks naturally creepy and unsettling. Unfortunately, he drops out of the picture so long that you might be genuinely surprised to remember that he actually is in the film when he pops back up. Leo Genn is also does a good job in a pretty typical detective role--he’s somewhat charming and is likeable enough that we want to see him succeed, especially when his superior is constantly hammering him for not being able to solve the mystery. The film’s release history is not quite as complicated as the plot itself, but it’s interesting nonetheless. AIP re-titled it Psycho-Circus, cut out 22 minutes of the film and released it in black and white for American audiences; somewhat similarly, the German film market de-saturated the film because Rialto Films were on the verge of releasing “the first full color Edgar Wallace film,” Der Bucklige von Soho, and didn’t want Circus of Fear to steal its thunder. Luckily, Blue Underground has rendered all of this tampering moot with their fine DVD release of the film. It’s not only presented in its full color glory, but it’s also completely uncut and even restores 8 minutes of footage that was discovered in a vault. The presentation itself is rather stellar, with the bright color palette bursting off the screen; the two-channel mono is equally as bright, delivering loud and clear dialogue. Extras include an audio commentary with Moxey, theatrical trailers, poster and still galleries, and talent bios. Don’t even bother with the numerous public domain releases of Circus of Fear, as Blue Underground’s DVD is the only way to see the definitive version. While it’s not a circus to go psycho over, it’s a decent little thriller with some clever twists, and it’s worth a look for Lee fans especially. Rent it!